Find computers that DO NOT have a specific application installed? I need the inverse of the built-in “Software installed report” where the report will generate a list of computers that do not have a specific software application installed. I realize that the search term will likely have to be an exact match for the installed application and I’m fine with that. I’ve made a new report and tried using modified code from the “Software installed report” to find computers without the software installed but so far my tests have not been successful. What does the list of software look like? Ultimately if you had a fixlet for each one, it could be relevant if it is not there. Then you could report the relevant fixlets for each computer. 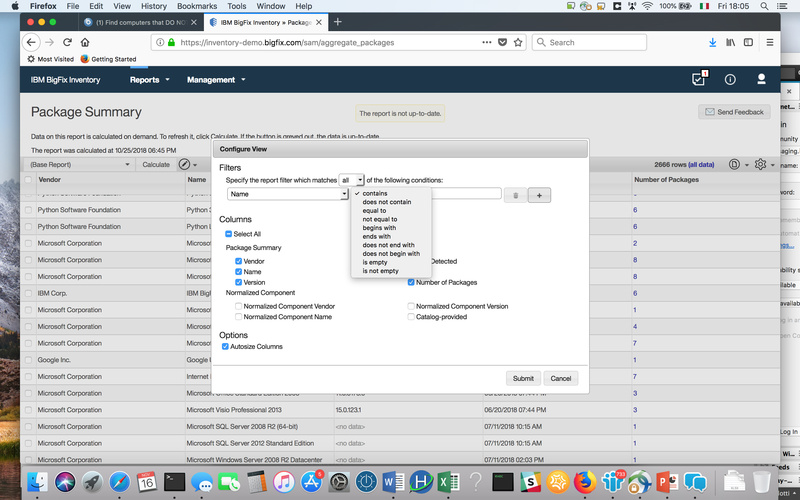 The “Software installed report” in Web Reports uses the BigFix client installed on the endpoints to itemize all of the software installed on said endpoints, not only the software installed via BigFix. Based on the guts of the “Software installed report” it’s searching “Installed Applications - Windows” and “Application Information (Windows)”? I could find out this information via relevance in a task/fixlet but I need a report to be emailed out listing the machines that are missing this software, which is why I want to use Web Reports. names of computers of (results (item 0 of it, item 1 of it) whose (not exists value whose (it contains "7-Zip") of it)) of (bes properties "Installed Applications - Windows", elements of it) of reported computer sets of bes properties "Installed Applications - Windows"
Note: I found the code in this thread: Find PC without software, so credit goes to @jgstew. The only change I made was to add a “not” to the exists test. As long as you can find the name of the application in the list of “Installed Applications - Windows” values to do a proper comparison, this should work for you.